Two comics from October 22, 2014. Plus a Second Opinion, featuring questions answered by a different listener each week, with Jason Sacks. On The Couch: artist Jim Rugg. It’s still October, kids, and we’re still reading scary books. Because when Andrea hits on a theme, she likes to really drive it into the ground, killing it slowly until its rotting, festering remains poison the water supply, causing pestilence and death for miles around. At least for the next two weeks, anyway. Today’s theme is about setting the tone. We’re looking at two first issues of new horror series, and how they establish the look and fear of what is to come. A new volume begins. How does it pull new readers in while living up to the expectations of fans of the first series? With a cool glass of milk. Gross. A brand new story. How does it introduce (and kill off) characters while raising the stakes with an appropriate creep factor? With the undead. And conspiracies. 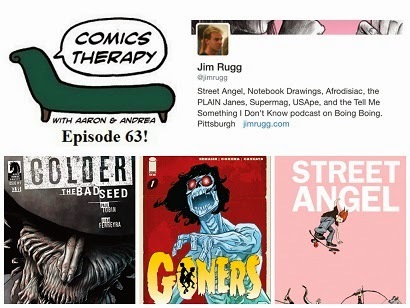 Back in episode 53, we talked about Jim’s comic Street Angel, published by SLG originally, re-released digitally by MonkeyBrain Comics, and beautifully packaged in a newish hardcover by AdHouse. He’s also the co-creator of the Ignataz-award winning Rambo 3.5 and Afrodisiac. He drew The Guild, written by Felicia Day and published by Dark Horse Comics, and pages for Joe Casey’s new Captain Victory series which we’ve also talked about, published by Dynamite. Jim recommended Jane, The Fox and Me, written by Fanny Britt with art by Isabelle Arsenault.